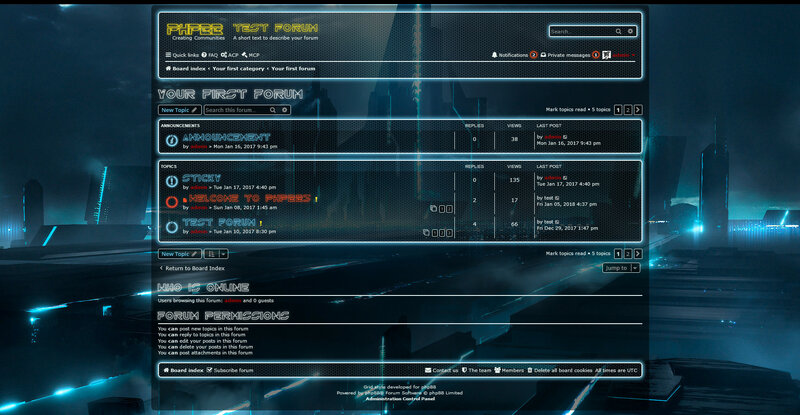 A futuristic / sci-fi theme inspired mostly from the movie Tron: Legacy. *Pulsing icons for new posts. *Color changing for reported posts. $G_DISPLAY_LOGO = Displays the logo image in the header. $G_CUSTOM_FONT = Displays a custom font on certain elements. $G_COLLAPSIBLE_CATEGORIES = Enables collapsible categories. Last edited by jrolson on Sat Mar 09, 2019 6:28 am, edited 10 times in total. I second that, amazing theme, great work, thank you. 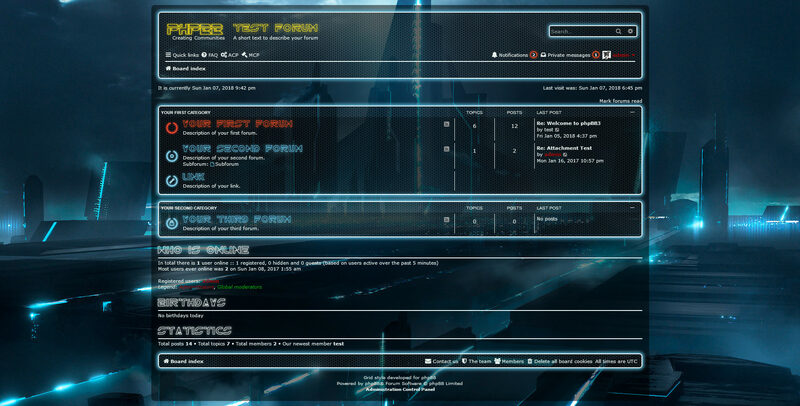 Yea I've always liked those see through forums but I never cared for those exotic fonts you have in there. But it does look nice. Good work! The font can be turned off in the config.html file. Oh I just noticed in your footer you are the author of Aero style also. That is one of the styles I selected to test at my test site. I like your work man/dogface! and have to back swipe blue to read. Where can we edit the .css colour code, to darken background for that area please. p.s. I think Steve said it is 'Field' from memory. A fix will be released shortly. I flicked back to ne-blackgreen default, but GRID is still a style option. instead of staying at top when scrolling. Any chance of a fix there? Oh, and the 'Breadcrumbs Menu Extension' don't display in the Sticky Nav Bar either. When having extensions displayed on a custom style it is sometimes necessary to customize the extension's css to fit the custom style. It may not be the style causing the extension to act that way but a background: #FFF; in the extension forcing that problem. With this transparent background a lot of extensions may need a seperate styles/ directory for this style. All defining solid color backgrounds in each extention's css would have to be changed. I'll test this style out on a few extensions on my test site. Last edited by Sniper_E on Fri Jan 05, 2018 4:25 pm, edited 1 time in total. *fixed missing avatar image on some pages. *fixed color of alert messages.